Guided by Spirit, the essence of your subtle bodies (Spiritual, Emotional, Mental, Physical, Ego and Soul) are seen in your auric field, along with your Chakra Lights. This view provides the kaleidoscope of the cosmic abstract of your self. From this spiritual view point, your portrait is painted on an 8×10 canvas, ready for you to frame in a color of your own liking. Katherine travels through the etheric levels to capture the glow of your Spirit. 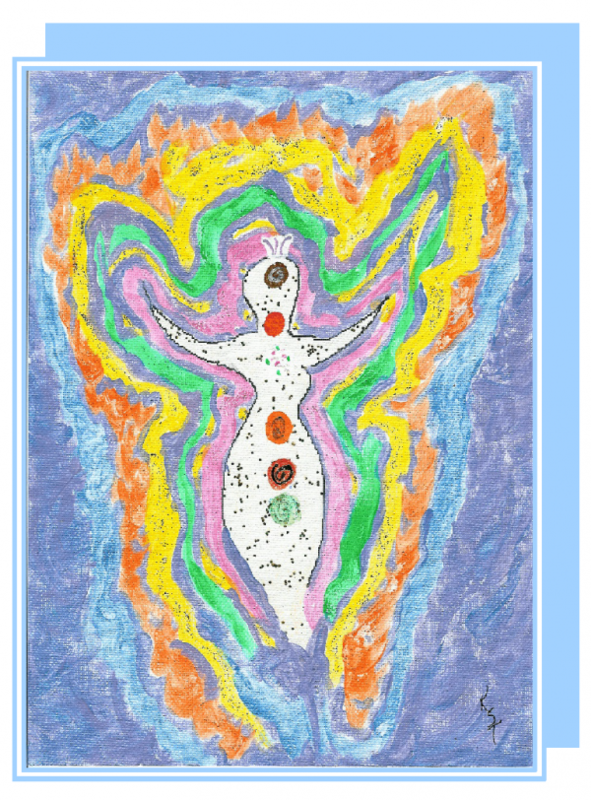 Her Shamanic travels bring forth the colorful array of your whole self. The colors provide a clue to your inner self and your spiritual self that is the conduit for the celestial realm of God/Goddess to send you energy to help you as you travel the Earth path. Your own conscious and unconscious states affect the flow of energy. When traveling through your path of life with clarity, moving through life with health, and living life through peacefulness, your colors will be vibrant. If you are ill, living in chaos or traveling through rough times in life, your colors may be shadowed with muted hues. The colors of your aura and Chakra centers change periodically, depending on your process. 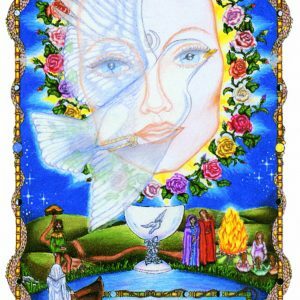 Katherine flows into the ethereal realm and walks between the world of Spirit and Earth consciousness while painting your angel self picture. It is a sacred experience and movement through multi dimensions of yourself occurs. She taps into your wholistic nature and depicts the spectrum of colors radiating from yourself through her painting. 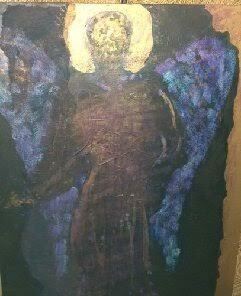 It is simple, yet profound as she makes the connection with your Etheric Angelic Self.